"If you’re making less than $100,000 per year as a family, you tend to not pay much of anything in tuition costs anyway - it is cheaper than going to a state school.” - Peter Cappelli, Professor of Management, University of Pennsylvania. In recent years, many colleges have expanded their outreach to low and middle-income families by offering extremely generous tuition discounts, sometimes over 90%. Of course, students from these families must still get in through the normal admissions process. In the chart below, a low income student admitted to Harvard can get a discount of 96%! Rules about how to define low income vary, but a family which earns less than $60,000 may qualify. 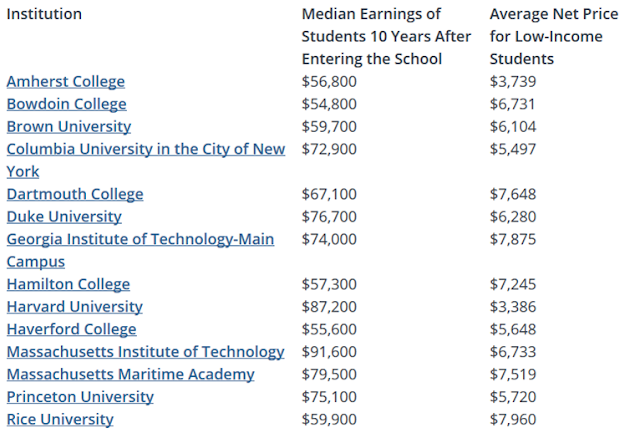 The New York Times Upshot column has also included many public universities in its list of colleges that do their best to attract low and middle income students.